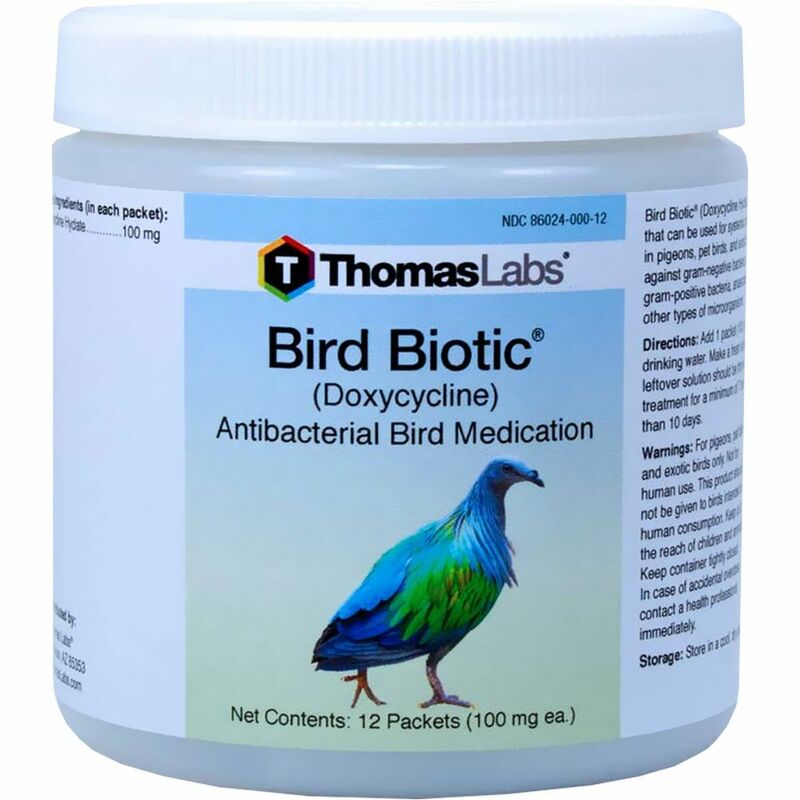 Bird Biotic® (Doxycycline Hyclate) is an antibiotic that can be used for systemic and local infection in pigeons, pet birds, and exotic birds. It is effective against gram-negative bacteria, as well as some gram-positive, anaerobic bacteria, and other types of microorganisms. Wheat Flour, Ground Wheat, Chicken Meal, Poultry Fat ( Preserved with Mixed Tocopherols and Citric Acid), Wheat Germ Meal, Dicalcium Phosphate, Salt, Parsley Flakes, Fish Meal, Dried Skimmed Milk, Distillers Dried Grains with Solubles, Malted Barley Flours, Brewers Dried Yeast, Calcium Carbonate, Potassium Chloride, Spearmint Flavor, Dried Egg Product, Dried Cane Molasses, Choline Chloride, Ferrous Sulfate, Vitamin E Supplement, Zinc Sulfate, Zinc Proteinate, Vitamin B12 Supplement, Vitamin A Supplement, Calcium Ascorbate, Copper Sulfate, Copper Proteinate, Niacin Supplement, Calcium Pantothenate, Manganous Oxide, Manganese Proteinate, Riboflavin Supplement, Vitamin D3 Supplement, Thiamine Mononitrate, Pyridoxine Hydrochloride, Calcium Iodate, Sodium Selenite, Folic Acid. Add 1 tablet (100 mg) to 8 oz of bird's drinking water. Make a fresh solution daily. Any leftover solution should be thrown out. Continue treatment for a minimum of 7 days but not more than 10 days. Warnings: For pigeons, and exotic birds only. Not for human use. This product should not be given to birds intended for human consumption. Keep out of the reach of children and animals. Keep container tightly closed. In case of accidental overdose, contact a health professional immediately.